Soft Milled Naked Cowhide 1.1-1.3mm. one lipstick pocket on the sleeve. removable liner for comfortable wear and protection against tearing. ever popular First Classic Orange label. Rivet detailing on each pocket for style. we like the arm length for those who need a little longer jacket. 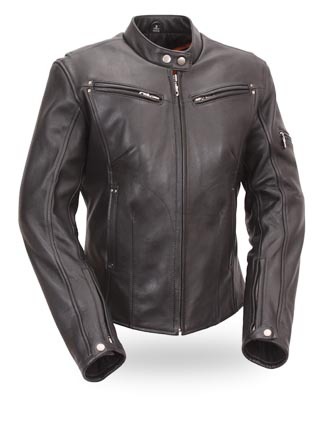 Click the button below to add the FIL157NOCZ Athena Womens Sleek Vented Motorcycle Scooter Jacket to your wish list.